Power and riches go together. But nowadays, they need political spin. Throughout history the very rich have usually also been the very powerful. And usually the very rich use that power to both protect themselves from the less well-off and to figure out ways to further enrich themselves. Often the enrichment comes at the expense of the less well-off. When you’re powerful, redistribution of income away from the poor towards yourself is often a lot easier and more lucrative than trying to be productive and creative. It’s been this way largely since the start of history. But getting the poor and middle classes to go along it can be a challenge. Of course blatant power, threats, and coercion were the means of choice for centuries. The pure power dynamic gave way over the centuries to class, the idea that somehow the rich were different people, better people. The poor and middling classes were taught that it was the natural way of things. Then the American and French revolutions brought out that dangerous idea: people really are fundamentally the same and they should have the same political rights. It was a very dangerous idea for the rich and powerful classes. It leads to questioning why the rich are rich and the poor aren’t. More importantly, this equality idea gave rise to a democratic governments. Democracy is a challenge for the rich and powerful. As historian William Hogeland has powerfully explained, the U.S. Constitution was actually created as a reaction by the rich and powerful against democratic finance well after the American Revolution. So how do the rich and powerful today attempt to overcome democratic impulses and further enrich themselves at the expense of the others? In other words, how do the rich and powerful get the poor and middle classes to go along with proposals that ultimately are only in the interest of the rich and powerful? One tactic is to simultaneously promote the idea that anybody can get rich and that success is purely a function of individual merit and effort. One blatant example of this is Republican presidential candidate Herman Cain’s statements that “If you don’t have a job and you’re not rich, blame yourself.” The unstated, but necessary assumptions behind such a statement are that sufficient opportunities exist instead of an economy where there is only 1 job opening for every 4+ job seekers. It also assumes that all power is benign and that the rules are truly fair and balanced. There’s a pernicious micro-economic theory called marginal resource productivity pricing (the MRP=MRC idea) that falsely provides a patina of cover for such ideas. I won’t deal with that here but I hope to in a future post. A second tactic is political spin. Proposals that are really attempts to use the government to further entrench the rich and powerful at the expense of the 99% are dressed up in language that is carefully chosen to sound like it’s fair and populist. But it’s a faux populism. It’s an attempt to fool voters. Flat tax proposals are just such attempts to fool voters into supporting proposals that will hurt them. Let’s look at how and why flat tax proposals are neither “fair” nor beneficial to the majority of voters, workers, or taxpayers. Inevitably, all flat tax proposals represent an attempt to raise taxes on the poor and middle classes while reducing taxes on the extreme rich, the top 1%. I’ve already analyzed and explained just how much Herman Cain’s “flat tax” proposal, the “9-9-9” plan would raise taxes on at least the 80% while providing a huge tax cut for the top 1% and even more for the top 0.1%. If there were truth in political advertising, Cain’s plan should be described as the “9+9+9=27% tax plan”. So the system is very, very mildly progressive. Flat tax advocates don’t make this “tax increase on the poor/middle class with tax cut for rich” aspect clear. They try to hide it and obfuscate it. They use terms like “flat” and “fair”. They are really trying to tap into our collective memories of childhood when the idea of everybody getting the same percentage of the birthday cake seemed like an obvious “fair” solution. They don’t want us to pay attention to the actual numbers. But even a “flat” tax rate isn’t really fair. There’s a phenomenon that’s described in economics as the “diminishing marginal utility of money”. In plainer English, it simply means that the richer you are, the more income you have, the less valuable any particular increase in income is to you. The reverse is also true, when you’re poor and don’t have much money, the value or utility of money is very, very high. An obvious example is to consider two extremes and look at the value or utility of having an additional dollar bill. To an unemployed person with no assets and no money, a dollar bill is very, very valuable. It may well represent eating vs. not-eating today. Life is dependent upon it. Now contrast that to a hedge-fund manager who has a tens of millions of dollars in income each year and even more cash in the bank. A single additional dollar doesn’t mean much. If a strong wind blows the dollar out of the hand of the unemployed, they will no doubt chase it. If it blows it out of the hand the hedge-fund manager, they’re much less likely to chase it. But some critics may point out that my example is using dollar amounts not percentages. Surely percentages would be the same. Not really. This time let’s consider someone working full-time at minimum wage. They earn $296 per week – gross. But after payroll taxes they’re closer to $275. That’s close to $1100 per month. One percent of that is $11. That one percent could easily represent the difference between bus fare or gasoline and not having it. In other words, that 1% represents the very ability to get to work and earn their income. It’s extremely valuable. It can be the difference between making it and not making it. For many seniors on social security, 1% is the difference between life-maintaining prescriptions and not. But let’s look at that hedge-fund manager again. The one with the $16 million dollar a year income. The monthly income is $1.33 million.Now yes, 1% for our hedge fund manager is $13,333 each month. It seems like a huge amount of money to us (I’m assuming not many of the 1% read my blog), is how big of a sacrifice will it mean to the hedge fund manager? Would paying an additional $13,333 per month really change the hedge fund manager’s life much? Not likely. It’s not likely to change the choice of first or second house. I’ll grant it might affect the choice of whether to have a third home or how big it would be. The point is that the sacrifice represented by 1% of income is greatly different depending upon your income. A flat tax does not represent equal sacrifice. The flat tax advocates also make much of the idea that a flat tax would simplify the tax code. Again the reason for claiming simplification is to get middle class voters to support something that isn’t It won’t. First, while some flat tax proposals start out as recommending the elimination of all deductions, exemptions, and tax credits, they rarely do in practice. Even Herman Cain has backtracked from his original proposal of eliminating all exemptions. It’s the personal exemption that gives the current federal income tax system much of it’s progressiveness. When push comes to shove, the political pressures and special interests that pushed for the deductions and credits originally rise up and force some kind of inclusion in the new proposal. Herman Cain, I understand has now already backtracked and decided to add back personal exemptions. That ends the “flatness” of his flat tax. Now it’s just a tax cut for the rich proposal. In the real world of politics and special interests, no flat tax proposal will stay that way. There are too many legitimate reasons why we don’t have a flat system now and they will inevitably reassert themselves. Charitable deductions (think churches and universities, not homeless shelters) and home mortgage deductions have powerful interests behind them. Besides, much of the complexity in tax forms comes from simply trying to determine what’s income and what isn’t. That won’t change. Simplicity is just false promise to make flat tax proposals attractive to the middle class. People in higher brackets pay a higher rate only on the portion of their income that hits that bracket — not on their entire incomes. Republicans have tried to sow confusion about this. They want Americans to believe, for example, that if the Bush tax cut ended, small business owners with incomes of $251,000 a year would suddenly have to pay 39 percent of their entire incomes in taxes rather than 35 percent. Wrong. They’d only have to pay the 39 percent rate on $1,000 – the portion of their incomes over $250,000. Get it? We already have a flat tax – flat within each bracket. Flat tax advocates also deceive by only focusing on federal income taxes. Payroll taxes, the Social Security and Medicare taxes, are regressive. People with incomes over $104,000 don’t pay any tax on the income above that threshold. People whose income comes from capital gains and not wages don’t pay any Social Security or Medicare taxes. Yet they are eligible for Medicare. 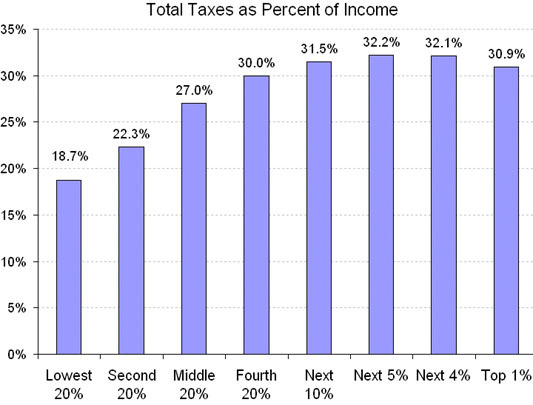 State sales taxes are highly regressive. Flat tax advocates don’t want to change those systems because the real objective is to shift taxes to the poor and middle class and give tax cuts to the top 1%. Finally, the biggest deception in most flat tax proposals is that capital gains, dividend income, and hedge fund management fees (called “carried interest”) are usually still provided special treatment. Herman Cain does this. He claims to want all income taxed at 9%, but in reality he proposes that capital gains and dividend income be totally exempt from taxes. In other words, the way that the top 1% generally earns most of their money would be tax free. How fair is that? It’s the current loopholes about taxing capital gains, hedge fund managers, and dividends at lower rates that results in the top 1% paying less than anyone else in the top 10% (see graph at top). Flat tax proposals aren’t about flattening tax rates. They’re about flattening the majority of taxpayers. But that doesn’t sell politically so they have to be wrapped in political spin to be something they aren’t.